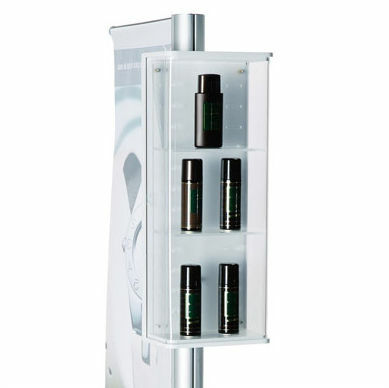 Exhibitor with display cabinet 30x30x70 cm. and 1 to portabanner of 500 mm. 730 x 1.890 x 400 mm. Exhibitor composed of mast forms to circulate of 1,850 mm of stop, bases to circulate of 400 mm of postormada finished diameter with has, display cabinet with key of 300x300x700 mm and 1 game of portabanner lateral of 500 mm.